This March and April the Escola Europea has opened its doors to students from universities and professional training centres in France and Spain. On the 24th of March, 76 students of logistics and supply chain from the Promotrans centres in Lille and Toulouse (in France) arrived in Barcelona to embark on the MOST (Motorways of the Sea Training) Management course. 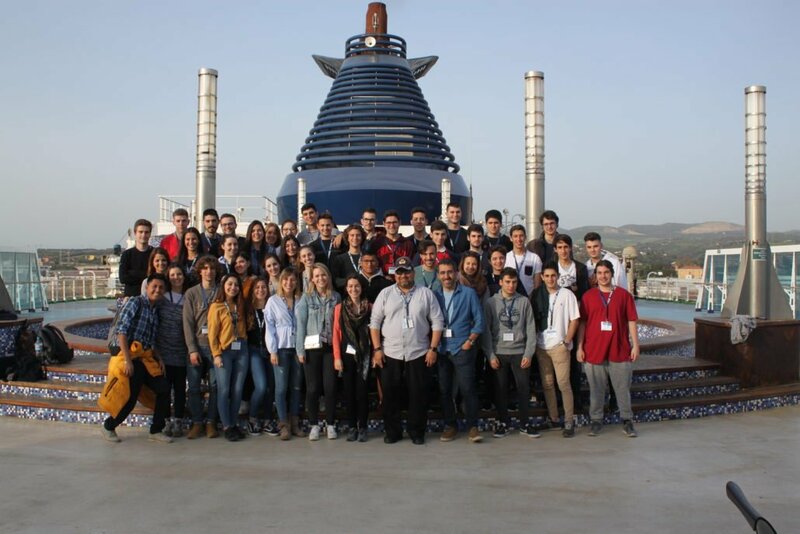 On the 14th of April 42 students of logistics and maritime business from Tecnocampus Mataró (affiliated with the University Pompeu Fabra in Barcelona) also began the 4-day long MOST Management course, which takes place in Barcelona, on board of a Grimaldi Lines Ro-Pax vessel on the crossing between Barcelona and Civitavecchia, and in Civitavecchia. The aim of the MOST course is to offer complete and concise training in intermodal maritime logistics, short sea shipping services and the motorways of the sea. The courses are aimed at both professionals and students of logistics, transport and international commerce. 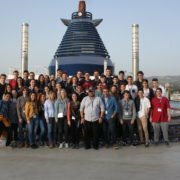 In both cases, the students began the theoretical training in intermodal transport and logistics in Barcelona, and then boarded the Ro-Pax vessel Cruise Roma to continue the training along the short sea shipping route between the two Mediterranean cities. The Port of Barcelona, the Ports of Rome and Grimaldi Lines collaborated with the Escola in the organisation of these courses. The teaching staff comprised professionals from the European transport sector as well as academic experts. This week, the recently inaugurated classroom of the Escola Aula dels Estels was filled with 57 students of transport management, logistics and international commerce coming from the EAE Business School of Barcelona. The students took part in the Escola’s MOST Intermodality course. Unlike the other two courses, this training did not include a trip on board of the ferry. Nevertheless it also offered a balanced rotation between theoretical lectures and practical workshops. The contents of the theoretical classes focused on intermodal logistics and the motorways of the sea; the port of Barcelona as a principal node for intermodal transfers; innovation in the transport sector; the management of port terminals and the Border Inspection Point and the presentation of an intermodal transport real case. The practical visits helped the students visualise the concepts explained during the lectures as they are applied in real life. Aside from the maritime visit of the port during which the different terminals of the Port of Barcelona were pointed out, the group could visit some of the terminals and witness their operations from the perspectives of their employees. The terminals that were visited were: Grimaldi Lines (including a workshop of a ro-pax vessel’s hold), Autoterminal, APM Terminal, the Border Inspection Point (PIF – according to its Spanish acronym), and LOGISTAINER, a logistics warehouse. With these comments, a student of EAE Business School and another of Tecnocampus confirmed the high level of satisfaction felt by the students at the end of the training. The educational focus of the Escola is based on research: students attend lectures and practical workshops and work on a case study in groups, which encourages collaborative work and group cohesion as a means to optimize the development of logistics chains.